Devotees of the site will probably have noted that a year has elapsed since our last update. This is because we can only upload files from places with access to an AOL server and half decent data transfer rates. In these areas that really means just New Zealand. Also, as we had carried out a major refit of Amoenitas in Tauranga, plus spent two months back in the UK for the birth of our first grandchild, Sean to Bruce & Tracey , we thought we'd save what sailing news there was for the end of this cruising season. This means that much to Nana Di's chagrin you are saved pictures of young Sean, who she is convinced is the best grandchild anywhere on the globe! Our story this season is of a voyage of 4165nm (7714Km) to many more beautiful islands in azure seas, populated by warm and friendly people from four very different cultures. Beginning with a voyage north through the entire chain of Tongan Isles to Samoa, the route then onwards forming a natural arc downwind to Fiji via the remote Wallis Island. However, before we return to tales of the pleasures and rigors of cruising the South Pacific Ocean we have a special memory from our 03/04 Kiwi stopover to relive. At the end of March, with boat work almost complete, we flew down to Fiordland on the far SW of New Zealand's South Island to attend to some unfinished business. 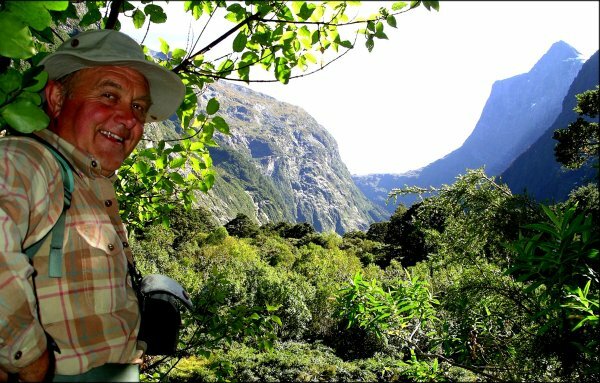 The Milford Track has been described as one of the finest walks in the world but one has to book months in advance to do it. There are two options. Firstly pay lots of money and have your gear, food and bedding provided in luxury accommodation with bags transferred by helicopter (mainly for Yanks and the sons of Nipon). Or, become a 'Free Walker' carrying everything you need in, plus all your garbage out. Needless to say, you'll know which slot best suited two hardened cruisers. 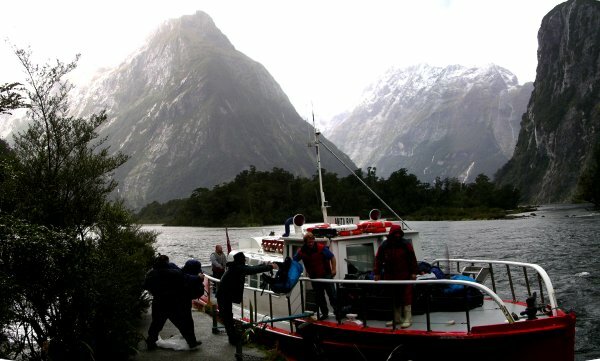 The walk of 53.5Km (33.5miles) starts at the end of Lake Te Anau climbing up the valley of the Clinton river to an altitude of some 1073m (3520ft) to the impressive Mackinnon Pass, then steeply down to the Arthur river which ends in Milford Sound on the Tasman Sea. There were 38 of us in total, we being part of a mini group with five friends, moving on day by day between the three huts with others a day ahead and behind us. In this region of prodigious wind and rainfall (averaging 4500mm), the weather can often dominate the event, as it did for us! 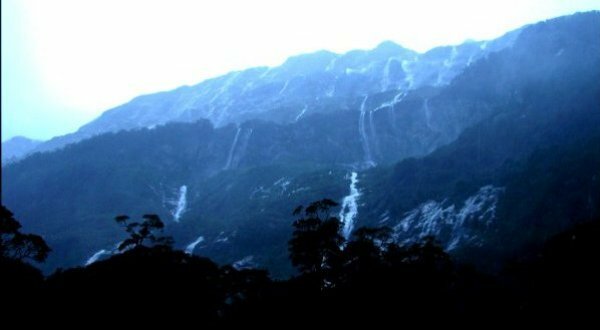 As we approached the halfway point at the pass, the pictures we took changed suddenly from stupendous valley views to those of rapidly appearing 'temporary waterfalls'. The Arthur River rose so quickly that we were detained at the hut, threatened with 'extraction' by helicopter. Much to our disappointment we eventually were sent off on foot with special instructions on landslips and sections of track usurped by rivers. The last 18Km to Sandfly Point were memorable for fording rivers almost waist deep and uncovering totally inundated tracks (see picture on the Home page). An exciting enough culmination to almost forgive the Gods of weather. This last, somewhat long leg of the track has to be accomplished in quick time to catch the boat which carried us the 30mins across the Sound to Milford, bringing to a conclusion a most memorable and 'character forming' experience. The whole infrastructure of the route is organised by DOC (Kiwi Department of Conservation) who do a fantastic job keeping the track open (most of the time) and making the huts for we independent trampers so welcoming. After the walk we recovered for a day or so in tourist ridden Queenstown, probably our least favourite Kiwi town, before going down to Doubtful Sound for some blue cod fishing. We had a chartered boat with friends and blessed with perfect weather this time, we caught lots of fish surrounded by the most spectacular, snow clad mountains. Alas, the time drew near to depart NZ all too soon. The immigration rules demand that we can only stay for a maximum of 6 months, then cannot return for a further 6 months. With natural concern over what is a pretty demanding and often dangerous passage north, plus the fact that we had spent so much of our Kiwi time allowance on boatwork and the visit to Europe, we felt even more reluctant than ever to depart. 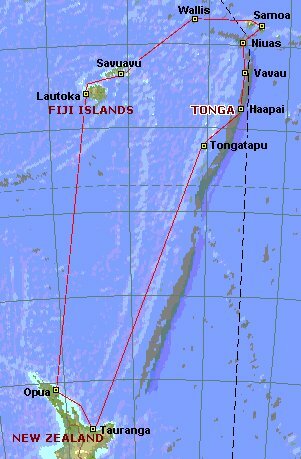 However, in mid May we left Tauranga on a direct voyage of 1150nm to Tongatapu, the most southerly part of the long Tongan chain of islands. This year the South Pacific autumnal weather was even more unpredictable than usual, with spurious depressions forming which tracked in weird directions resulting in a trip that had more than its fair share of gales and tough conditions. Nevertheless, after nine days we arrived at Tongan capital , Nukualofa in good spirits. The town dominates the southernmost island of Tongatapu and has most of the country's population but sadly has little to reward the cruising yachtsman, especially as the weather continued to be unsettled for a further three weeks. Eventually the need to escape to some of the other 170 islands of the archipelago overcame our doubts about the winds and seas so we set off north in what turned out to be much more robust conditions than predicted. Our target was a 1Km long island just within a day's sailing range. In the tropics where invariably there are coral reefs to be negotiated in good light at each end of a trip, a day sail should be under 50nm. After a long hard day in 30-35kt winds (just less than a gale) and huge breaking seas we somewhat apprehensively approached the giant breakers on either side of the narrow gap in the reef on the SW of the island. Its amazing what you are capable of when the alternative is a very uncomfortable night at sea. Once through and close to the reef we found just enough shelter to make a stay tenable. Note the contrast in the colour of the water with the last image of Milford Sound that sunshine and 25° change in latitude brings about (3,300Km). This was pure magic. 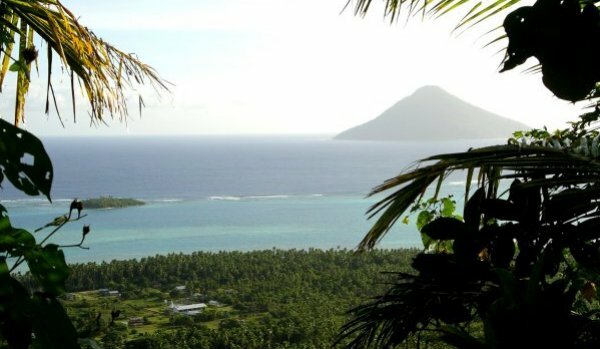 A refuge from the seas on an uninhabited, Robinson Crusoe island entirely to ourselves, with lots to explore and crystal clear waters for diving and snorkeling. 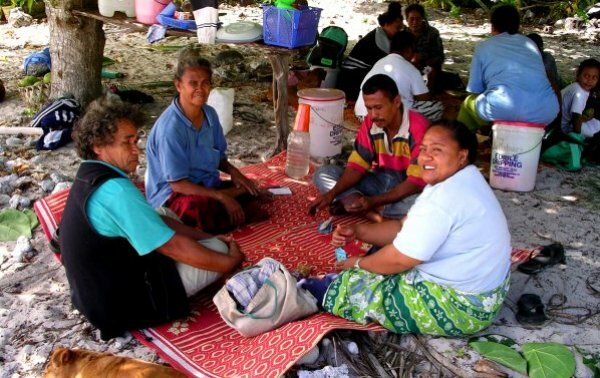 However, it was a further week before conditions lightened enough to move on to explore the dozens of other islands of Tonga's central Haa'pai Group. Many were inhabited by small communities of exceedingly friendly people who where outnumbered significantly by their free roaming swine. Villages of a hundred or so souls survived by subsistence farming so there was no source of food for purchase other than a small range of dry goods from a shed or front room stores. 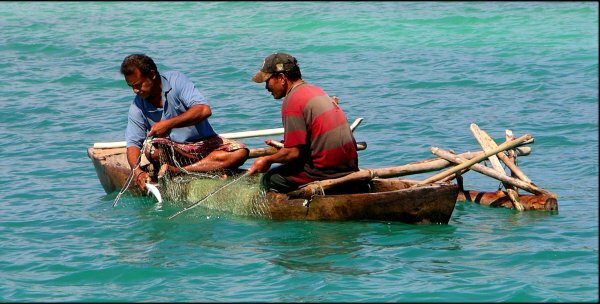 When strong trade winds re-appeared, as they do on a regular basis and we were 'hunkered down' with several other boats off the island of Haafeva, we decided to unite in a minor attempt at restoring the population balance. 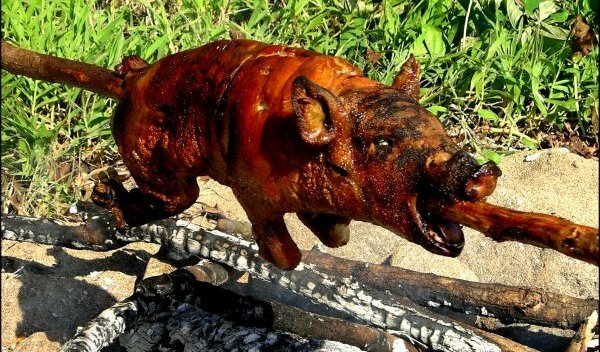 After choosing and negotiating the purchase of a small pig, we set about preparing a Sunday afternoon pig roast on the beach. It was a great success, largely due to the help we received from a local called Peter in dispatching and preparing said animal. Yet another one of life's minor survival skills to add to the long list we are acquiring from a cruising life. From the Haa'pai we moved on to the Va'vau Group, towards the northern end of the 350nm (600Km) long chain of 171 islands comprising the nation of Tonga. We had called there first on our way across the Pacific to New Zealand two years before so were content to visit a few more of the myriad of splendid anchorages that make it a cruising mecca. However, no longer for us the relatively huddled masses, so after a couple of weeks we headed north again to Tonga's northern outpost of Niuatoputapu, an isolated community little visited by yachtsmen. In fact, even the name is a bit of a mouthful for most of them who consequently tend to refer to the place as 'New Potatoes'. The name is in fact a derivation from the Tongan for 'Sacred Coconut'. The anchorage is approached through a very narrow pass, just deep enough if one has the light right, to dodge the odd coral head. Not quite as easy though when one has the huge sea across the entrance that accompanied our arrival. Thankfully, the large tranquil anchorage made up for all that. This quiet backwater has few visitors and very poor connections to the rest of the country, so we were not surprised that the first question we were asked was had we got any tobacco aboard. In spite of a disappointing answer the people were extremely friendly so it wasn't long before we were attached to a number of families. We even hosted Salesi's 5th birthday aboard as Tongan boys love anything to do with boats. It was very easy to wile away the days here, walking, climbing the ridge or just watching the fishermen in what seemed to be a single, shared, outrigger dugout canoe. Fishermen having a good day. We exchanged canned drinks for some of the catch. Niko, one of our friends came from a family of 13 children (a typical family size for Tonga), born on the high symmetrical, volcano island of Tafahi which is around 10nm north of the pass. He came for help as the winds had got up just as he, his wife and two boys needed to get to a large, extended family feast there one weekend. So expecting around 4 to 6 additional crew we agreed but pointed out it would be an extremely rough trip. Come dawn the next day we couldn't believe the numbers gathered on the quay. The word had got around and everyone with family on Tafahi seemed to want to join in. We pruned it down to as many as we could safely fit in the cockpit, around 12 as it would be too rough to have passengers being thrown around below. Once outside the pass they quietened considerably and for around an hour of 30+kts of wind and huge breaking seas over the shallows between the islands we were surrounded by grim faced Tongans gripping buckets, bowls and bags. Needless to say we were welcomed into the extended family as if we had always belonged. Whilst cooking preparations were made, Niko's brother David guided us up the the mountain on a steep almost indistinguishable route. Hard work in that heat though it was, the view from the tropical rain forested peak was superb. The rich red volcanic soil, combined with the atmospheric moisture of the higher slopes grew splendid crops, especially yaqona, Tongan kava. The family's main source of income seemed to be this root crop used to make a mildly intoxicating brew which Niko exported from Niuatoputapu. Back down at the beach the feast was prepared. 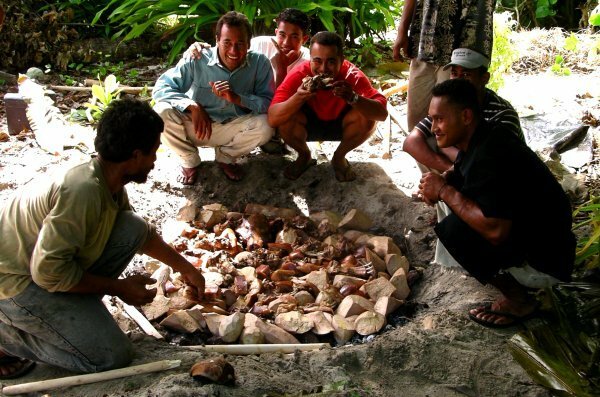 Cooking was in a traditional umu, pig meat and vegetables spread over hot rocks in a depression in the ground and covered by a blanket of large taro and banana leaves. Below Niko and David (centre) have just opened the umu exposing pork, breadfruit and cassava. We sat cross legged in the gathering of around 50 family for a most memorable feast. Afterwards there was a serious family meeting which appeared to involve dispersal of shared funds to any who were needy. After a game of beach volleyball, all that remained was to get the visiting party safely back across the boiling seas and through the narrow pass by sunset. As we entered the shelter of the bay all our charges through off their sickness and broke out into spontaneous singing, no doubt in gratitude for a safe return. Just before we reluctantly moved on we experienced a special, joyous occasion when the 3 monthly supply vessel arrived on the wharf just 200m from where we anchored. We had been told it was cause for a gigantic, all island celebration with rare treats like ice creams from freezer chests aboard (the island has no electricity, therefore no refrigerators). All the schools emptied whilst almost everyone on the island made their way to the wharf. Of course we were in on it all, enjoying the experience of climbing aboard, to clamber over mountains of lumber deck cargo to the bridge deck where the ices were. Our next voyage of two days took us NE across the International Dateline to Samoa, a country comprising two large islands that have only recently embraced visitors and tourism. The dateline issue can lead to confusion, especially when, like us, you gain an extra Monday going east, only to lose a Saturday going back to the west (good job we are retired or that would have represented a really bum deal). We anchored in the large harbour of the capital Apia to discover a little known jewel of a country. 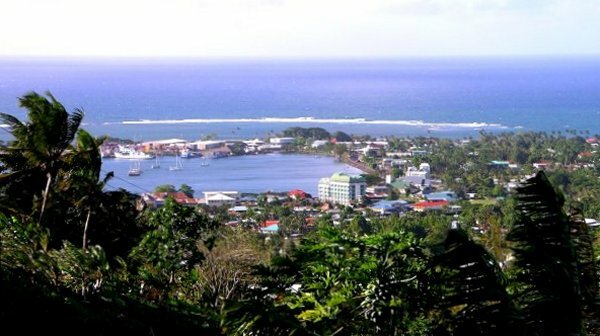 The town was much more developed than nearby examples from Tonga or Fiji and the Polynesian culture was alive and flourishing to a much greater degree. As a bonus the annual South Pacific Forum meeting was been held there a week after our arrival. This is attended by the Prime Ministers of over 20 regional island states large and small, including those of Australia and New Zealand. It was interesting to be a bystander, observing the comings and goings, particularly Helen Clark, NZ's PM who left for an official visit to Tuvolu, a dependent state (300nm north) in the RNZN frigate Te Kaha from the dock just next to our anchorage. There is so much to see and do in Samoa that one could almost spend the entire cruising season there. It is also one of the cheapest places we have visited with an abundance of fresh food and produce to satisfy all tastes. 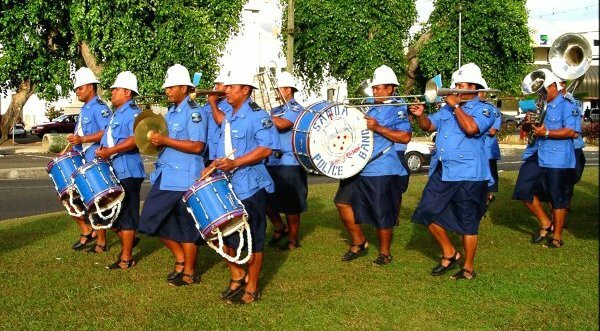 One can start any weekday in Apia with the police band who leave the fire station yard at 07.45, marching and playing along the harbour front to the government's main administration building where they play the national anthem whilst the flag is raised at 07.55. On the hillside, just outside the town is the one time home and final resting place of Robert Louis Stevenson complete with a superb museum of his life and works plus a lot of archive photographic records of Samoan life. A visit well worthy of a full day of anyone's time. We got around the town and local area on our mountain bikes which are stored in stripped down form in an upper forward bunk (wheels, pedals & handlebars removed, all in individual canvas bags). They were great for getting the 2Km from the dinghy dock into Apia centre along the spacious esplanade but once into the town traffic, life in the saddle became a very precarious afar. We quickly realised why we were lone cyclists, the others had been wiped out by inattentive motorists long ago! However, in certain circumstances cycling alleviates one problem with Samoa, that of the heat. Typical daytime temperatures were around 30-35°C, so provided you keep up sufficient speed you generate an adequate cooling breeze. That doesn't help on the many steep inclines though, like the road up to RLS's house when shirts were totally saturated with perspiration long before we got there. 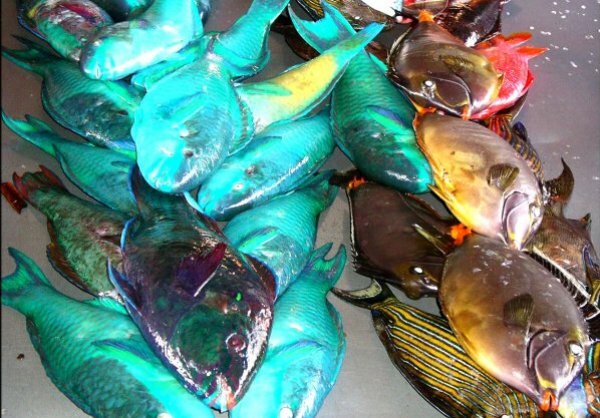 Apia has two huge markets, one specialising in vegetables, the other in fish. The range of marine produce was beyond anything we had ever seen. Aside from the colourful selection of reef fish below, there were tuna, crabs, lobsters, moray eels and octopus. The latter we just had to indulge in to rekindle fond memories of pulpo in olive oil from Galicia in northern Spain at the beginning of our voyage, now over five years ago. 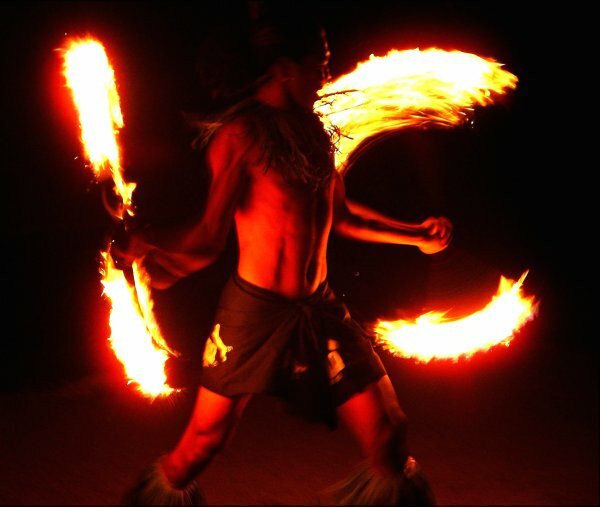 Amongst the many local cultural activities we were able to observe on a regular basis at waterside bars was firedancing, a Samoan specialty. Many youngsters were only too keen to demonstrate their skills as they honed them for the big festival in early September. Most of them were in their early teens or twenties and judging by the scars on their bodies, only those with the swiftest reactions could survive. Outside the one large town on each island, houses quickly lost their walls to become fales. These open structures with mats or blinds to provide shelter from the rain, were superbly adapted to the hot climate. 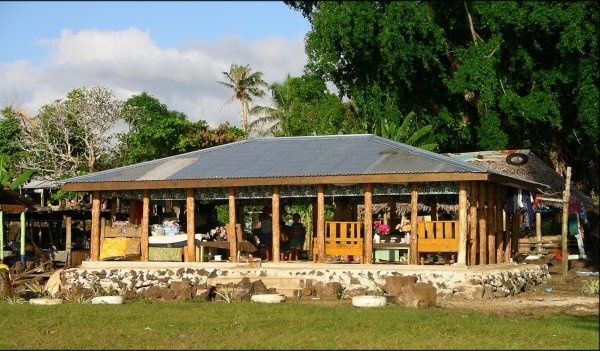 To western eyes, security of property might seem an issue but not in Samoa. Outside Apia there are no police, the law being enforced by village chiefs and crime is almost unknown. The traditional fale design is not just confined to the just main home but features as a beach front place of relaxation or even a place of retreat near the home. 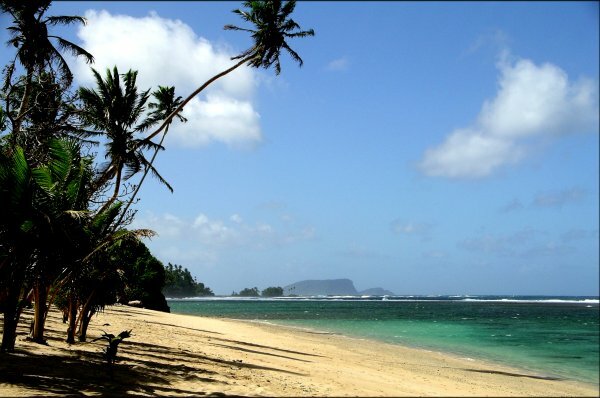 Along almost the entire south coast of the main island of Samoa (Opolu) there are beaches to die for, protected by an offshore coral reef which often supports plentiful marine life for the snorkeler to enjoy. The little tourist activity there is being based mainly on basic, grass covered fales within metres of the shore. Rainfall is pretty reliable so impressive waterfalls are common in the mountainous terrain. 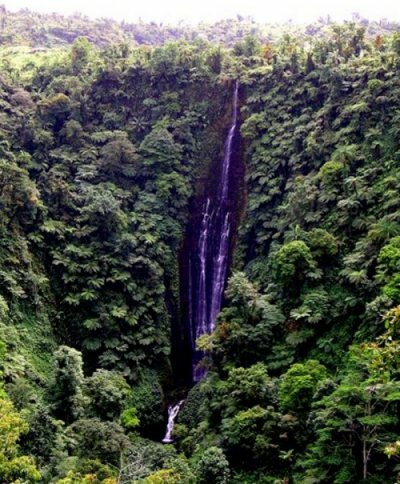 In one valley close to Apia there are what are known as 'The Sliding Stones', a series of around five cataracts that the brave of heart can launch themselves down, plunging at high speed into a pool below. Though great fun it is not recommended for a fall of the proportions of the one below. The second island of Samoa in terms of economic importance, though slightly larger in size, is Savaii which is only 20nm to the west. Whereas Opolu is richly fertile, Savaii has experienced more recent volcanic events so is lava strewn and somewhat bleak in comparison. 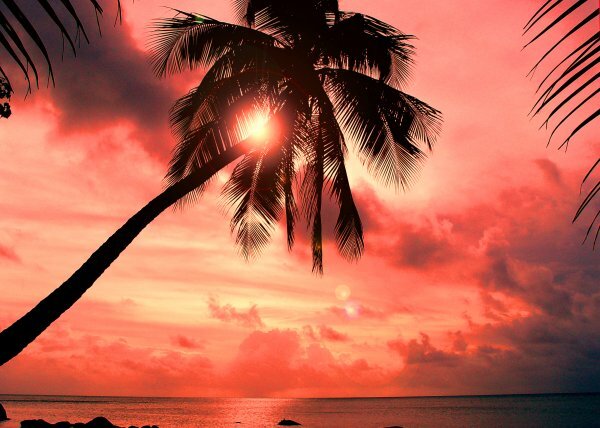 Nevertheless, the people are equally warm and the beaches on the south side extremely inviting. 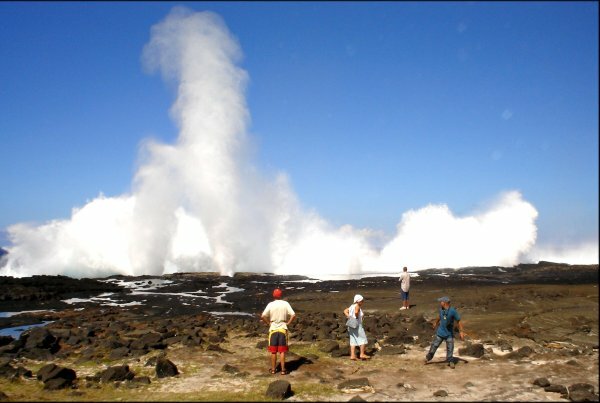 There are also some splendid blow holes where the incoming Pacific rollers crash into lava cliffs which over the years have been subjected to undercutting. Massive volumes of water are sent skyward through vents accompanied by a deafening whoosh. 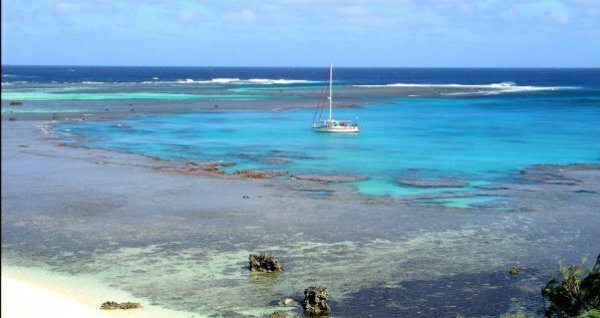 From Samoa it was a pleasant 200nm sail to arrive at dawn off the pass through the reef on the southern end of the remote French territory of Isle Wallis. Two years ago we were in the Society Isles of French Poynesia so we were fairly well prepared for the cultural shock of an attempt to transplant a Gallic culture into the wastes of the Pacific. Again, one of the more dominant first impressions is the incredibly high cost of living, with even basic foodstuffs at many times European or US levels. Just one example, a single cucumber on the supermarket shelf was £10 (17$US), so there it remained. 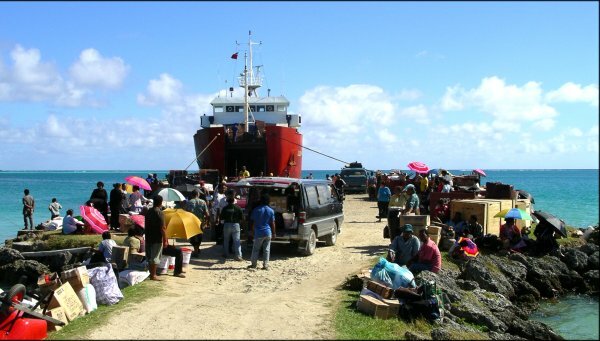 This in spite of the fact that the same New Zealand based supply ship served Wallis and Samoa where prices of virtually everything were 3-5 times lower. In many respects it seemed a very divided society with native and ex-pats sharing little aside from the financial inducements of high subsidies and inflated salaries paid to maintain the status quo. The main island of Uvea is a beautiful place of neat villages with colourful gardens and stunning views over the azure waters of the lagoon to palm clad motus (small islands). Again the mountain bikes were assembled and we toured most of the 16 x 7Km island. This time they were a necessity as there was virtually no public transport. So, where one could easily hitch a ride on the east coast road, getting to the remote western side on dirt roads through the rain forests where you might not see a vehicle all day was impossible. There were some wonderful sites to visit, including two impressive crater lakes about 1Km across. Lanutavake had steeply sloping sides to water 100m below whilst Lalolalo had vertical cliffs of red volcanic rocks of comparable height. It seemed very strange to be visiting all the island sites over a series of days with never a single sighting of another tourist. Most of our three weeks there were spent at anchor off some of the many motus where the swimming, snorkeling and diving were exceptional in waters so clear we could see for typically 40m. To the north of Nukuhifala (above) the waters covering a pretty barren reef were shallow but for a single deep, dropping to 18m for a length of around 300m with a cliff drop off on one side. This confined stretch of water supported a staggering variety of marine life. Yet another impressive sight occurred one quiet Sunday morning at anchor off the small eastern village of Gahi when around the point came a fleet of around a dozen racing outrigger pirogues. Their simple rig was identical to the monohull boats with crew out on poles for balance that we had seen in Marin on the SW coast on Martinique in the Caribbean. Wallis will also be remembered for a rare and special long range amateur radio contact back to Wellow, our home village in the south of England. Fellow HAM, colleague and friend of over 30yrs, Chris Richardson (G3NAE) and Dave, with Jim (G3IWV) from Christchurch on the side, set up a contact on 14MHz using the difficult propagation path to the opposite side of the world over the north pole. This is a such a rare contact that Dave was persuaded to send out his first QSO cards of the trip with the prestigious callsign of FW/M0CJG/mm (FW the Futuna-Wallis prefix, mm denoting a Maritime Mobile station). From Wallis we sailed the 400nm to check into Fiji at Savusavu on the large eastern island of Vanua Levu where we had spent time during last year's tour of those waters. From there we revisited the charming little island of Yadua with its magnificent diving, then deviated west across Bligh Water to the Yasawa Group that we had not had time to visit before. At the bottom of that chain of islands we were once more at the check-out port of Lautoka, preparing for the voyage back down to New Zealand. This return trip turned out to be the best of all the five passages between NZ and the islands we have made. Amoenitas covered the 1109nm in less than 8 days at an average speed of 5.84kts with only a modest 30hrs under engine. Before we close this year's saga, it might be worth a comment on two aspects of cruising life that have recently benefitted significantly from the advent of digital technology. Firstly, when we passed through Singapore in February we managed to replace our simple 'wet film' underwater camera with a digital version with a good 40m case. This has meant an amazing improvement in both performance and ease of use. So, hopefully you will appreciate this if you check out the updated Marine Life page of the site. The other change has been to entertainment aboard. Again thanks to the amazing opportunities provided by the Sim Lim Towers of Singapore we managed to replace our TV and video tape player with a 17" flat LCD screen and a disc player that supports DVD, VCD, MP3 and music CD formats. This is not only much more compact, much better quality and lower power consumption but also more convenient viewing within the confines of the saloon cabin of a cruising boat. We are now back in our favoured haunt of Tauranga for a third cyclone season in NZ. We plan to spend Christmas here. Then we hope to fit in some North Island touring before flying back to the UK for 6 weeks to attend younger son Paul & Emma's wedding on 5th March. That will also be a great opportunity to catch up on the first year's progress of our first Grandchild, Bruce & Tracey's son Sean, as well as spending quality time with Di's Mum. By the time we return to NZ in April it will be time to be preparing for what may be our third and possibly final departure from Kiwiland for the Islands to the north. The plan at the moment is to sail to Suva in Fiji where we can get a visa for Australia. 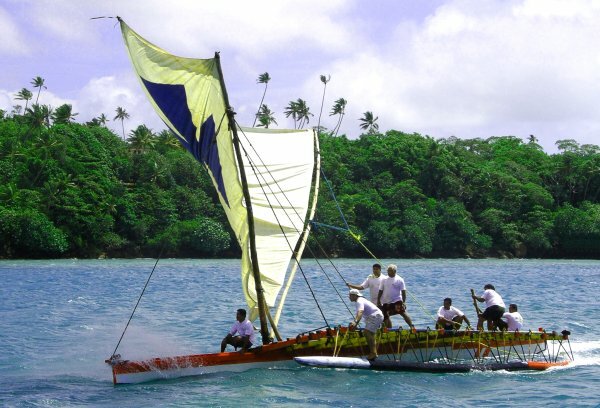 Then we will cross to Vanuatu, a beautiful cruising area with superb diving but sadly also prevelent to malaria. Finally we will head across the Tasman Sea to Australia in November for the next cyclone season. The longer term plan is to spend several years there, touring Oz and returning from time to time to cruise the islands to the NE like New Caledonia, Papua New Guinea, the Solomons and possibly Vanuatu again. When we will resume our circumnavigation it is difficult to tell as we are still enjoying the cruising life so much. The current fear is arriving back in Europe too soon and then wondering what other alternative life style could possibly replace this one.